Last weekend there was a so called "supermoon", where this month's Full Moon coincided with the Moon's closest approach (perigee) to the Earth. This made the already large Full Moon, bigger and brighter than normal. This created quite alot of interest, especially with the help of news headlines and social media posts stating clearly, that this would be the biggest and brightest Full Moon of the Year, an event not to be missed!! I myself also posted an announcement on our Observatory Facebook page. I was momentarily surprised when a similar post on Science Centre main Facebook, gained more than 100 likes in a matter of minutes. Immediately I began to compose another post to include more specific details about the event, only to realise that I was describing this event as relatively inconspicuous, basically saying that "yes it will be bigger, but not THAT much bigger". 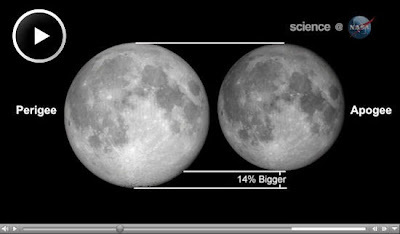 Alas, in the end I deleted this information and instead posted some basic facts about the size difference and how to observe the Full Moon. The thought occurred to me that despite all the excitement and hype, this might be one of those times to sit back and let others decide for themselves whether they thought the moon looked bigger or not. Admittedly, from my experience this particular Full Moon did look marginally larger than average and I have heard many other people also observe a slightly larger and brighter appearance. In reality the difference between the Moon's closest distance (perigee) and furthest distance (apogee) is only very small (around 42000km) compared the average distance of the Moon from Earth (388,000 km). However, observing the Full Moon is sometimes open to individual interpretation, especially when it only occurs once a month and because of an illusion a normal moon looks bigger when its lower in the sky and smaller when its higher. This is sometimes caused by comparing the moon to objects on the ground like trees and building or statues, which may vary size due to their distance from the observer. Basically, the further away an object is, the smaller it looks. 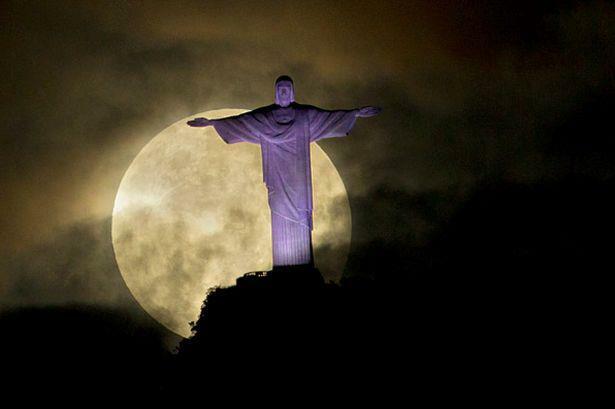 So when the moon is low these distant objects it looks much bigger by comparison thus creating a supermoon illusion. When the Moon is higher up in the sky there are less objects to compare it to, therefore the size difference is only very slight when comparing to previous Full Moons. As you can see, as an educator I have a habit of dispelling misconceptions and providing the most accurate information I can, however this event made me think about encouraging others to explore ideas for themselves. I also thought about how helpful words like "BIGGEST", "BRIGHTEST", "FIRST" "LAST" and "MOST SPECTACULAR EVER" can be, as they seem to be very helpful in getting "likes" to posts, heeheehee.